December is here and so is gift-giving season! I've been spending quite a bit of time on the web, looking up crafty ideas and filling up my Pinterest boards. 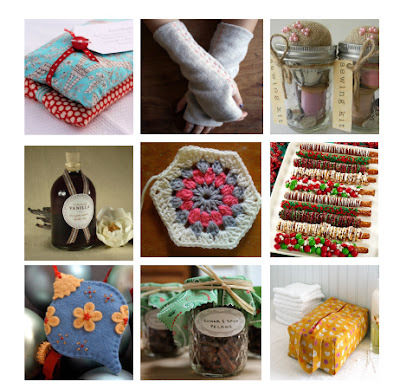 I compiled some of my favorite gift tutorials. Ok, and I snuck in my pecans, because they are one of my favorite gifts to make this time of year. What are some of your favorite crafty gifts? Feel free to add a link in the comments. Hi Christine, thanks for the links to all of these tutorials. I'm definitely in the crafty spirit these days. I was wondering if you were going to the BurdaStyle Sewing Handbook Launch Party in San Francisco on Monday. I am going to do my best to be there, and I thought it would be fun to meet other Bay Area sewing bloggers.